New York Jets Super Bowl rings are simply among the most popular around. Virtually every one of the replica rings, regardless of price, sells. There are a variety of them available at various prices. It's simply a matter of how much you want to invest. The better the ring--the more it looks like the one Joe Namath owns--the more expensive it's going to be, but seldom do they cost more than $275. You can go the cheap route, too, and get a decent looking one for less than $70. In Super Bowl III, the Jets were the first AFL team to beat an NFL team, which at the time, the AFL was considered inferior to the NFL. 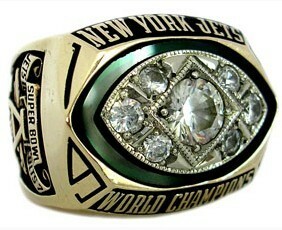 The Jets championship ring from the 1968 season might stand alone, but is well worth its weight. The 1968 NFL season was a great year for the Jets. After completing the season at 11-3, Namath and his eight-year-old team went on to face the Oakland Raiders for the AFL championship. The Raiders were 12-2 that season so they faced a playoff game with the Kansas City Chiefs, who were also 12-2. The Jets went on to beat the Raiders 27-23 and had their attention turned to the heavily favored Baltimore Colts for Super Bowl III. Baltimore posted a 13-1 record that year and had dominated the NFL. The league was already considered the superior league so when the Jets came in and defeated the Colts 16-7 (New York only allowed Baltimore to score once, in the fourth quarter), the sentiment started to change course. It culminated in 1969 with the Kansas City Chiefs in the AFL defeated the Minnesota Vikings, leading to an equal merger. Some Jets Super Bowl III rings are made of alloy and plated with 18K gold. Most have 7 CZ’s that are either glued or prong set. They are pretty heavy and weigh about 100 grams. You can sometimes find replica rings with a solid wood championship ring box, which has a glass top. The ring inside that one is constructed of jewelers alloy and plated in 14K gold. The cubic zirconia on this ring were hand placed. It's best to simply browse through the listings and read them carefully to decide which Jets Super Bowl ring design fits your taste and your budget.